EA Play’s press conference was packed with thirty minutes of Star Wars: Battlefront II multiplayer but lots of people wanted to see the campaign. We did. After that showcase ended, I sat down to watch a developer-guided runthrough of an early story mission. The 15 minute sequence was full of dogfights, stealth takedowns, and laser blasts. It seems good. The previous Battlefront did not have a campaign. This one does. Just as 2005’s Battlefront II dropped players in the boots of Imperial stormtroopers, this latest version of the game focuses on the Empire. 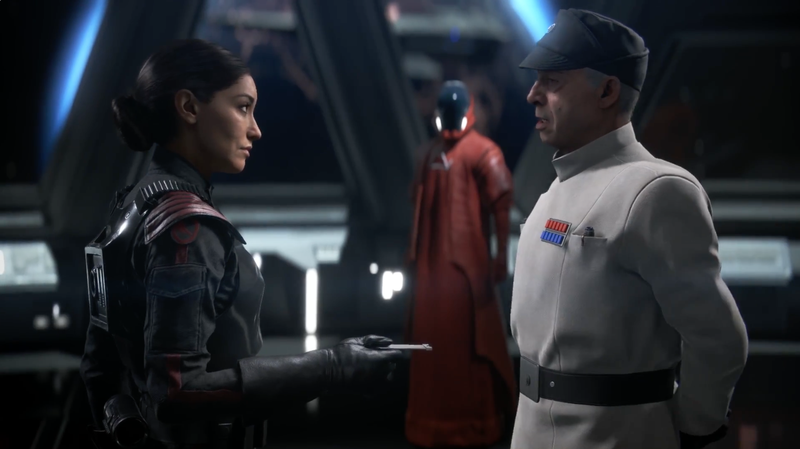 Players control Iden Versio, leader of an Imperial commando unit called Inferno Squadron. In the demo EA showed today, Iden was recalled to the planet Vardos following the destruction of the second Death Star at the end of Return of the Jedi. She receives orders from her father, an Imperial admiral, to put her squad together for a new mission. A strange envoy of the Emperor relays the late leader’s last commands via a helmet that bears his likeness on a holo-screen: carry out Operation Cinder, a plan to disrupt the Rebels in case of the Emperor’s demise. Focusing on the Empire shows them struggling to fight back against the Rebels. As Iden prepares for Operation Cinder, the shipyard she is stationed at is attacked by an overwhelming Rebel force. The first portion of this level took place in the cockpit of a TIE Fighter and tasked the player with wiping out Rebel cruisers and protecting a squadmate from an ambush. Functionally, it seemed much close to the 2005 iteration of the game than the more recent 2015 Star Wars Battlefront’s Fighter Squadron mode. Character banter and well-contextualized objectives took a forefront and the result was a segment that didn’t merely feel like a small slice of the multiplayer but exhibited a more cinematic vibe. As the Imperial fleet is ravaged by a cruiser’s powerful ion cannons, Iden flies directly into the enemy ship’s hangar in a very smooth transition from dogfighting to boots on the ground action. The gunfights that followed were constricted to tight corridors that were a perfect fit for various gadgets like thermal grenades and a droid that could be sicced on Rebels to shock them into submission. This section caught my attention more than the dogfights, as it managed to flow from a pitched hangar assault to a stealthier segment through a weapons bay complete with silent takedowns and door hacking. Leaping from stealth to combat felt natural for an Imperial commando, as did smaller affectations like an active reload mechanic that allowed Iden to quickly vent the heat from her blaster and keep up a furious rate of fire. The mission ended as Iden sabotaged the ion cannon’s power, blowing up energy cells that erupted and sent lightning arcs toward squads of enemies. The whole thing wrapped with a story sequence where another ship crashed into the Rebel vessel, seemingly launching Iden and her teammate Hask into the vacuum of space. A large takeaway from this story mission are the small touches that brought a lot of flavor: Rebels were not just humans but a wide array of alien species like Sullustans, Twi’lek and Quarrens which contrasted nicely with the uniformed Imperials. A tiny gonk robot droid provided a small bit of option cover, honking and beeping all the while. These touches made the game world feel like something far more substantial than a reskinned multiplayer mode. I’m a huge Star Wars fan and found 2015’s Battlefront disappointing with its chopped up content and a bare bones approach to gameplay but I left today’s presentation with a sense of cautious optimism about the story and the various scenarios it would present. I don’t know if I’m quite ready to root for the Empire but if the rest of the campaign can live up to this mission, I might just change my allegiance and join the bad guys. The new game is set for release on PC, PS4 and Xbox One on November 17.